It was unnatural, but it felt so right, you know? But then I saw the creative team. Ryan North? “Dinosaur Comics” always makes me laugh, I guess. Erica Henderson? I dug her work on “Subatomic Party Girls”, and I always enjoy the art she posts online. Rico Renzi? That guy’s a coloring genius. Okay. I may be a Squirrel Girl skeptic, but in the Law Offices of North, Henderson and Renzi I trust. I decided to try it out. Five issues later, “The Unbeatable Squirrel Girl” is still on my pull list. Five issues later, it’s one of the first books I read when it comes out. Five issues later, it’s maybe my favorite Marvel comic. I…I think I might be nuts about Squirrel Girl. There are many reasons why, but the first is this: Marvel’s all about the “All-New, All-Different”, and hoo boy, there aren’t many comics more “different” than this one. And I mean that in a purely complimentary way, as the team has managed to create a title that is as brilliantly and simply steeped in Marvel continuity as any out there while still feeling completely fresh and inviting. And it’s not because it’s reinventing the wheel on comic stories. Case in point, over the first four issues – which takes place over two hours, real time – Squirrel Girl fights Kraven the Hunter, Whiplash, some bank robbers and mother flippin’ Galactus. That is par for the comic book course, and if you really step back and look at it, the “what happens” part of the comic is crazy packed. What’s different about it is the approach. North and Henderson depict Squirrel Girl doing these things, but the problem solving and methods of “winning” are equally hilarious and ingenious. Trust me when I say that the way the team approaches superheroics is unlike anything we’ve really seen before. It’s done in an unbelievably effective, entertaining and unexpected fashion. You may think you know what Squirrel Girl fighting Galactus would be like, but trust me when I say you don’t. There’s a reason why the fourth issue of this series is on my personal short-list for the best comics I’ve read in 2015. Doreen Green – aka Squirrel Girl – is a winning character (and not just because she, like Al Davis, just wins, baby) that is intelligent and utterly badass. In previous appearances that weren’t written by Dan Slott, the character had been used as a joke of sorts, North and Henderson somehow strips back the parts of the character that have always made her that, rebuilding her in a way that makes her a part of that same joke. Everyone’s in on it here, not the least of which is Doreen herself, and that makes the character both more charming and the book funnier for it. And that’s another big part of what makes this book work so well. It is truly funny, both because of North’s quick wit and deftness with absurdity and Henderson’s exceptional cartooning, which turns gags like Squirrel Man and the last appearance of Whiplash in the series into genuine laugh out loud moments. Some will scoff and pass off elements like the social media opens and the meta-commentary at the bottom of each page as the hipsterism and indiefication of Marvel (lizard brain! ), but there’s a reason why they’re there: they work, and they work well. One thing that people forget is that the magic of comics comes from all elements – the words and pictures – working together in a seamless, additive way, and few Marvel books exist as better reminders of that than this one. When you read this book and see North and Henderson’s profiles (as drawn by Henderson) at the top of each letters column, it’s a hint at how well this team works together. It’s more than the sum of its parts, and this book has some pretty magnificent parts. 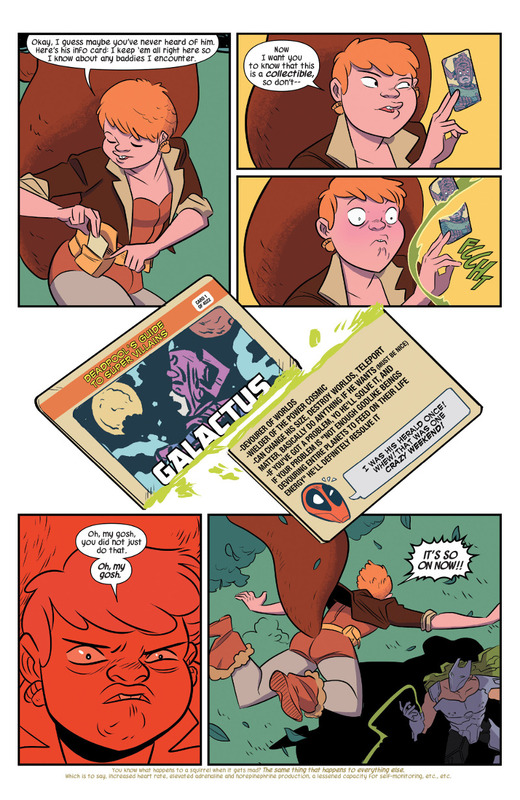 A quick aside: mega bonus points to Maris Wicks and Kyle Starks for their part in the absurdly brilliant Villain Cards Squirrel Girl uses in her battles. They’re both excellent exposition points for new readers and hilarious. Double threat! Maybe the best thing of all is this: it’s something that can be shared with young readers. North and Henderson deliver the story in a way that can truly entertain people of all ages, and many times in different ways. One of the underrated parts about reading it monthly is seeing the young readers or their parents sharing their love for it for that very reason, and that type of thing just adds to the charm of the book for me. This comic is a joyous read, and one that is unlike everything else on the stands. Is it your typical Marvel series? No. It is its own thing. We need more of that though. What “the Unbeatable Squirrel Girl” happens to be is one of the funniest and most original titles around today, and a book that consistently surprises and delights with its unique approach to a genre that often feels stale and uninspired. If your lizard brain told you to stay away from this book, tell it to quiet down. If my experience with this book has told me anything, it’s that we should all listen to our squirrel brains just a little bit more. Note: The reason this review only references the first five issues is it is a review of the first collection’s issues. Naturally.